Once you’ve upgraded your MYOB data from the Classic version to MYOB AccountRight Live, follow these simple steps to get your budgets linked to the new version. Because the MYOB data is stored differently you’ll need to create a new organisation in Calxa and transfer your existing information to that. Certain settings cannot be copied or imported to the new version so must be set up manually, these are described in Further Settings to Consider. If you have any difficulties our Customer Support team is only an email or phone call away, or our Accredited Partners can help with onsite assistance. Below are the general steps. Click the links for more detailed explanations on each step. Create a new organisation in Calxa by connecting to your new MYOB AccountRight Library data. For details refer to the Calxa support note article: Connecting and Updating: MYOB AccountRight. Once you have created the new organisation you should see two companies with the same name listed in your organisation list. Note the different MYOB logos for Live and Classic. You will need to repeat the export steps below for each of your budget versions. Click Export in the main ribbon. Make the following selection in the export screen. Select Last Year, This year and Future Years that have budgets. The new MYOB data does not have years prior to Last Year so exporting years prior to this will be redundant. Select the first Budget Version. Repeat the export process for each budget version. Select Text file, export and import process is much faster with text files and we will not be editing the data. Set Export Format to Monthly Amounts. SetBudget Type to All accounts. Select Export comments enabled, Export detail accounts only and Suppress empty rows. Click Export and Save thefile with a name you can easily recognise later. If you have more than one budget version you will need to create budget versions in the new organisation, otherwise you may skip this step. Repeat the steps below for each additional budget version required. Click Edit in the main ribbon. Select the MYOB AccountRight Live organisation. Click the New button above the Budget Versions column. 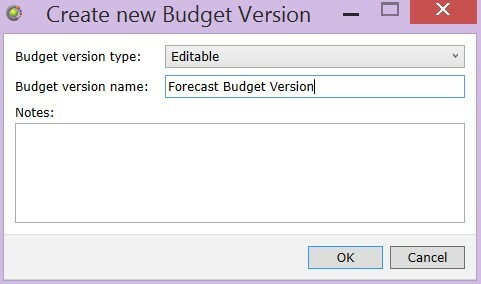 Set Budget Version Type to Editable. 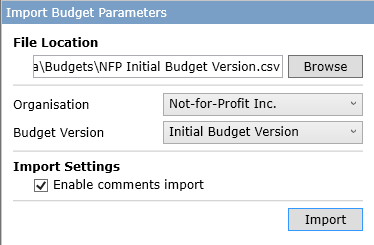 Type the name of your new budget version in the Budget Version Name field and click OK.
You will need to repeat the import steps below for each of your budget versions. Click Import in the main ribbon. Browse and find your previously exported budget files. Select the new MYOB AccountRight Live Organisation. Select the first Budget Version. Repeat the import process for each budget version. If you created custom Account Trees in your MYOB Classic organisation you will need to copy them to the new AccountRight Live organisation, otherwise you may skip this step. Repeat the steps below for each Account Tree. Click Account Trees in the main ribbon. Select your new AccountRight Live Organisation. Select the drop down menu that is part of the Create New icon. 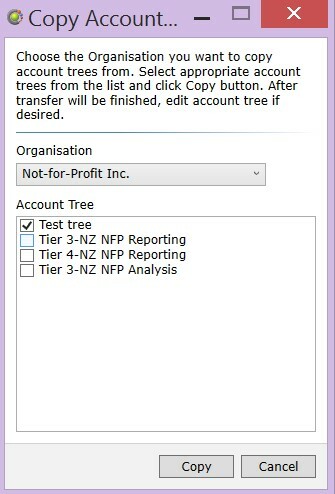 Select the MYOB Classic Organisation and tick the first Account Tree to copy. Repeat the copy process for each Account Tree. Following is a list of settings that cannot be copied or imported and must be setup manually in your new MYOB AccountRight Live organisation. The links will take you to associated help notes. Default Accounts and other Cashflow settings. Custom KPIs, specifically the Account Groups as the KPI Formulas are not organisation specific. Report Bundles, you will need to edit the existing bundles to use the new organisation.